A robust C unit testing framework. White box testing, also called structural testing, is used for testing different execution paths. 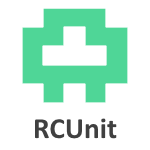 RCUNIT can catch some signals thrown during a test run. This allows further tests to be executed instead of just terminating the test run. Signal handling (a major contribution from Tomasz Kantecki at Intel IE). Simplified creation/retrieval of test module and test registry.